Backcountry fishing is easier in the winter for some folks wanting to avoid the heavier seas and still catch fish. December 5th 2018 – Cold fronts are a part of life here in Key West fishing this time of the year. Winds come up to about 20 – 25 mph out of the Northerly directions and harass us with falling temps as the rest of the nation gets pummeled by snow and real winter weather. Here at Dream Catcher Charters we just have to deal with a bit of wind and 15 degree temp drop. 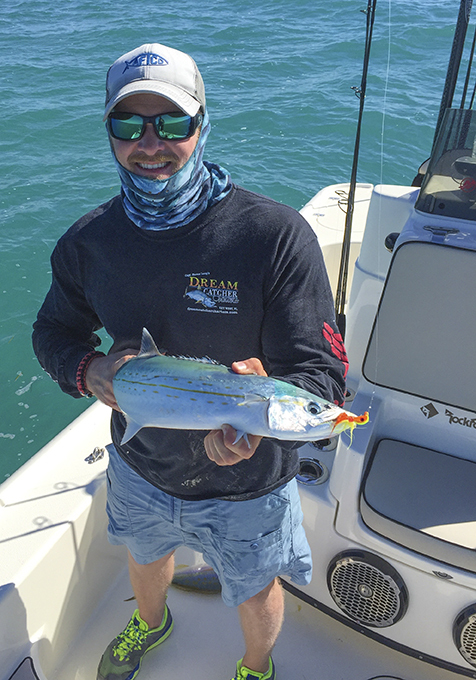 Spanish mackerel like this one are a blast to catch on light tackle. Key West fishing. Backcountry fishing seems to be the thing to do when the winds are up here in Key West. It’s easier. The winds bring higher sea conditions offshore on our deep sea fishing charters so many of our anglers chose backcountry fishing to be in calmer seas. If catching fish in calmer waters and having a good time hearing the drags burn a little is an anglers objective, then backcountry fishing is the way to go. Catching a volume of fish is easier fishing out back. With the number of fish species we have here in the winter time its no wonder that we can catch over 50 fish in a 4 hour trip. All while in the comfort of our bay boats in the lee of the islands of the backcountry. This month in the backcountry anglers can expect to catch trout, ladyfish, sharks, barracudas, blue fish, pompano, the occasional red fish, Spanish mackerel and Jacks. We are noticing a huge increase in speckled sea trout “specs” this year. More so than the years past. So far this year our backcountry fishing charters are catching plenty of them.. Our trout are a tasty way to get some filets for dinner. Be sure to give us a call and check for availability to book a trip in December. Our schedule is filling up fast. We do 4, 6 and 8 hour trips for up to 4 persons on our bay boats. We also have a 28 ft center console that is super comfortable for larger groups up to 6 persons.